Looking for Balance in Life? L ooking for balance? Forget it! Balance is impossible. I am not trying to give you bad news, that's the job of your local radio talk station. My objective is to wake you up to the truth; balance is not real in terms of human capacity. 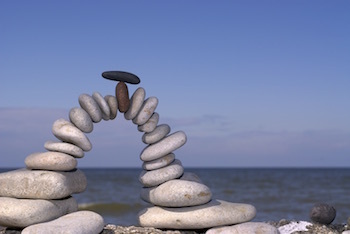 How can anyone balance things? We have compartmentalized our life and activities. You have family, relationships and work; you have worship, recreation, hobbies, volunteerism, and maybe you even have a couch in front of a 60" flat screen TV. Some time back, I took an assessment focused on trying to estimate life balance. It challenged the participants to rate the parts of their life on a scale of 1-10 with 10 being the highest rating. The participants were then to correlate the higher and lower scores of each compartment of their life. This approach, unfortunately, just leads to creating even more compartments; not balance, as this is our human tendency. Over these years of discovery, I have found this paradigm to be true: When trying to balance things, the action in and of itself creates imbalance. Actually, it causes you to rob from one compartment to feed another compartment. Life is rather about convergence; not balance. It is about living your purpose; your Gift, in all parts of your life whether you are at work, home, or at play. If the theme of your life is to bring the good out in everything and everyone, then living that in each part of your life will create meaning and fulfillment. Living in this realm will always be more effective than trying to balance. If the theme of your life emulates hope and appreciation for all you have received, its application everywhere and with everyone will bring you synergy and convergence. As your Gift (Divine Intent) becomes the foundation of all the compartments of your life, your life becomes more unified. The greatest speakers I have met were the same on and off the platform. They were the same in a spot light as they were in the daylight (everyday light). Consistency of being is a great part of what this truth of convergence is all about. Ask yourself these questions: 1. What is the most important personal characteristic I have to share? 2. In what environment am I most apt to share it? 3. Where am I least apt to share it? 4. Why do I restrict its application? 5. What will help me be more consistent in applying my Gift, focus, or positive character? Thom shares with us how to prepare to become ourselves.